The capital’s little-known art deco heritage. ART DECO REFERS to a design aesthetic that emerged in France in the early twentieth century and was widely popularised during the 1920s and 1930s. In particular, it informed the design of many of the twentieth century’s most iconic buildings, including the Empire State Building. Dublin, too, was home to many examples of art deco architecture. Many have been lost to the annals of time, like the Theatre Royal in Dublin. Others others have survived and can still be admired today. Catherine Thibault is a French national based in Dublin. A longtime art deco enthusiast, she started documenting the last vestiges of art deco architecture on view in the city. She set up a blog and started highlighting some of the city’s best examples in order to help foster an appreciation of art deco architecture and promote a conversation about the importance of preservation and conservation. With that in mind, we decided to ask her for her guide to some of the city’s standout art deco buildings. Once the site of the Maples Hotel, the building located at 23 Kildare Street is now home to the Department of Business, Enterprise and Innovation. Designed by architect James Rupert Boyd Barrett, these were the first government offices to be designed following the establishment of the State and the building remains a classic example of Art Deco architecture. Something to take a gander at next time you’re strolling down Kildare Street. Standing at the edge of Rathmines is Kodak House, a premises once operated by Kodak. Designed by architects Donnelly Moore and Keatinge, the elegant white building was completed in 1930 and stands out amidst the traditional residential housing in its immediate vicinity. A listed building, it is now home to the offices of an advertising agency. If you’re walking down D’Olier Street, it’s impossible to miss the striking facade of the building formerly known as the Gas Building. Now home to Trinity College’s School of Nursing and Midwifery, the building has been lovingly preserved both inside and out. The interiors are particularly impressive with crystal chandeliers and grand foyers worthy of The Great Gatsby on show. Designed by renowned architect Herbert Simms, this housing development and single storey kiosk are replete with stunning architectural details. From the kiosk’s geometric railings and ornate clock to the apartment complex’s rounded corners, it’s an art deco paradise in the middle of Dublin 7. When you think of The Palace on Camden Street, it’s unlikely that the architecture is the first thing that springs to mind. However, the former nightclub and pool hall is housed in one of the city’s most enduring examples of art deco architecture. Once home to a 1,300-seat cinema known as The Deluxe, the building’s facade is steeped in glamour and boasts decorative tiling from the early twentieth century. A fact to share with your pals next time you’re stomping up Camden Street after a night out. Built in 1939, this remains one of the standout examples of art deco architecture in the city. From the stunning exterior to the stylish entrance way, it’s a winner in every way. The building was recently purchased by the Department of Education and is expected to be turned into a post-primary school. Dotted along the promenade at Bull Wall are a number of notable structures inspired by the art deco movement, including men’s and women’s bathing shelters. Designed by the aforementioned Herbert Simms, the striking yellow shelters with their curved edges and grand staircases are simultaneously modernist and old school. No wonder they are so beloved by sea swimmers. With thanks to Catherine Thibault of Art Deco in Dublin. 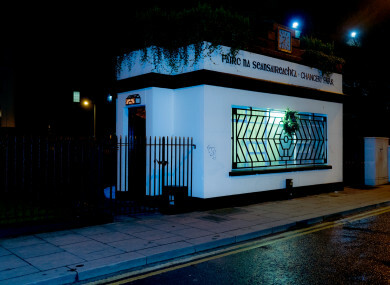 Email “From flats to nightclubs: An insider guide to 7 overlooked art deco gems around Dublin”. Feedback on “From flats to nightclubs: An insider guide to 7 overlooked art deco gems around Dublin”.